(CNN) -- A federal jury Thursday found a 32-year-old Minnesota woman guilty of illegally downloading music from the Internet and fined her $80,000 each -- a total of $1.9 million -- for 24 songs. 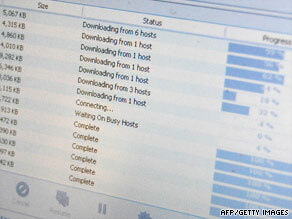 Illegal downloads of musical files will cost a Minnesota woman $1.9 million, a jury has decided. Jammie Thomas-Rasset's case was the first such copyright infringement case to go to trial in the United States, her attorney said. Attorney Joe Sibley said that his client was shocked at the fine, noting that the price tag on the songs she downloaded was 99 cents. She plans to appeal, he said. Cara Duckworth, a spokeswoman for the Recording Industry Association of America, said the association was "pleased that the jury agreed with the evidence and found the defendant liable." "We appreciate the jury's service and that they take this as seriously as we do," she said. Thomas-Rasset downloaded work by artists such as No Doubt, Linkin Park, Gloria Estefan and Sheryl Crow. This was the second trial for Thomas-Rasset. The judge ordered a retrial in 2007 after there was an error in the wording of jury instructions. The fines jumped considerably from the first trial, which granted just $220,000 to the recording companies. Thomas-Rasset is married with four children and works for an Indian tribe in Minnesota.